"Hello, Kotaku." 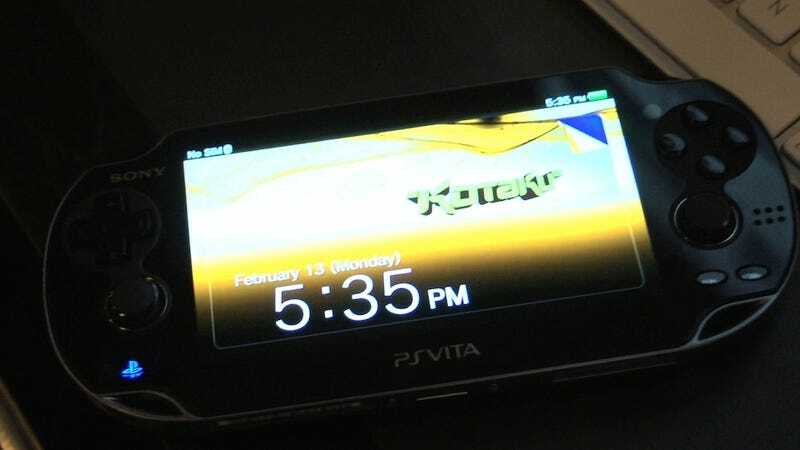 | Sony cheekily included a customized greeting on the Vitas they sent us to review. The best physical attributes of the PlayStation Vita are the machine's big screen and twin analog sticks. Got tips for our editors? Want to show the world your latest creation? Ready to anonymously share an unannounced game? Email us at tips@kotaku.com. Or leave us an anonymous voicemail at (612) 568-2581. Click here for the Speak Up or Tips forums. Want a more "blog-like" look? Click the button up top next to "Top Stories." Want to just read about video games? Try KotakuCore and you'll get news and opinion about video games minus our coverage of gaming culture and the cultures with which gaming intersects. Want even more Kotaku? Want to know which of your friends read us? "Like" us on Facebook and follow us on Twitter.